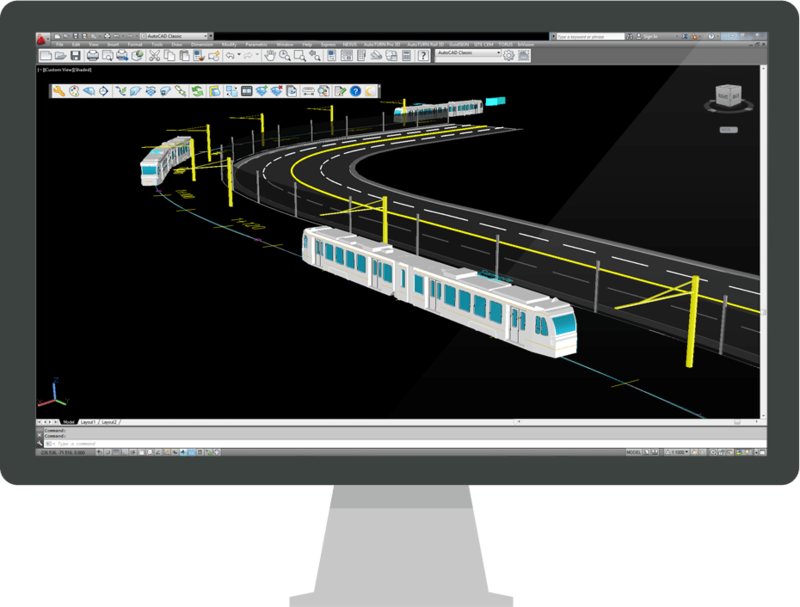 Light rail transit design and analysis software. 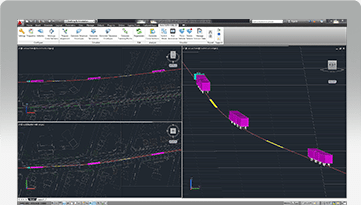 Incorporating the trusted AutoTURN® engine, AutoTURN Rail 3D is an advanced rail design and analysis solution that expedites the clearance analysis for evaluating new track layout or verifying LRVs (light rail vehicles) on existing tracks. Beyond the analytical functionalities, AutoTURN Rail can be used for visualization purposes such as animating realistic 2D vehicle plan views and 3D realistic vehicle models along the path. AutoTURN Rail helps designers account for clearance issues a light rail train may encounter along any section of track. Once the designs are finalized, designers can then use the software to check the safety of their concepts. What use to take hours of painstaking work now only takes a few minutes with AutoTURN Rail. AutoTURN Rail Overview Accommodating Designs in the 3D Era As railways become a more prevalent mode of transportation for goods and people, more infrastructure will be needed to accommodate increased ridership. Space is at a premium in many major cities, meaning rail lines will be built with very tight clearances, taking up as little space as possible. Designing in 3D will give planners a precise view of the right-of-way they need and ensure safe operations and accurate planning. Designing in 3D gives planners a precise view of the right-of-way they need and ensure safe operations and accurate planning. https://transoftsolutions.com/wp-content/uploads/2016/03/ATRAIL_placesimulation_big.png Overview 3D LIGHT RAIL VEHICLE SIMULATIONS Simulate design vehicle movement on user prepared alignment (horizontal, profile, and cant) in 2D and in 3D that is sensitive to changes in elevation as well as cant/superelevation. Plus, users can control properties like 2D line type, type of vehicle and many more. Simulate design vehicle movement on user prepared alignment (horizontal, profile, and cant) in 2D and in 3D that is sensitive to changes in elevation as well as cant/superelevation. 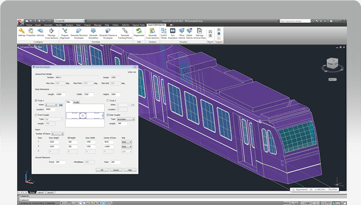 https://transoftsolutions.com/wp-content/uploads/2016/03/ATRAIL_EASILYCREATELIGHTRAILVEHICLES_big.png Overview CREATE LIGHT RAIL VEHICLES Recreate a project design vehicle that reflects manufacturer specifications in AutoTURN Rail. Attach manufacturer’s static and dynamic envelopes, and any user defined vehicle envelopes (e.g. for maintenance and construction tolerances) to the vehicle - the software uses these to generate clearance envelopes. Recreate a project design vehicle that reflects manufacturer specifications in AutoTURN Rail. Attach manufacturer’s static and dynamic envelopes, and any user defined vehicle envelopes.